Hard Knocks’ fighter, Owen Carr, has come a long way to get to where he is now, from studying martial arts in a concrete basement to winning international Tae Kwon Do championships. His fighting career has even found him inside a makeshift “cage” in a dive bar. Training with UFC fighter Wanderlei Silva in Las Vegas, he has proven that he’s a fighter not to be taken lightly. Carr began traditional martial arts more than twenty-three years ago when he was five. He trained Tae Kwon Do in a basement, where he says he was a “natural ninja” and his instructor taught him the true ethics of martial arts. Carr competed in more than eighty Tae Kwon Do tournaments and became the youngest person to receive an adult level black belt in Canada at the time. Carr went on to try a little boxing, kickboxing, and some no gi grappling but went back to Tae Kwon Do to represent Canada in the World Martial Art Games. After that, he joined Champion Fight Club and started fighting inside cages in bars. Carr’s first MMA fight was held in a bar where the owner welded together a four-sided cage and placed it on the dance floor. Carr’s recalls that people could get seats so close to the cage, they could reach their hands inside and pat him on the back. Still a teenager and only training in MMA for three weeks, he went into his first MMA fight wearing a black speedo because MMA shorts hadn’t been invented yet. For his first match, he was thrown into the cage against a “larger, super ripped older guy named Bill,” he recalls. “I just remember kicking him in the head five or six times, TKD-style, and then I choked him,” Carr said. Carr won, and his MMA career was born. He recalls his first main event bout, in another broken down bar, where “fans” would look down into the cage and yell obscenities at the fighters. “(MMA) was so barbaric (back then),” he commented. For a year, Carr fought in bars and Rumble In The Cage events. When he finally signed up for his first real professional bout in 2007, he was more than ready. He defeated his opponent in 43 seconds of the first round via TKO. After four more professional bouts and a 4-1 record, Carr flew to Las Vegas to try out for UFC fighter Wanderlei Silva’s fight team and reality show, “Fighter Life.” When Carr made the team, Silva recognized his talent and allowed him to stay in his guesthouse during his time there. “I didn’t know what it meant to be a fighter until training there,” Carr said. But it wasn’t until he met UFC fighter Duane Ludwig that he solidified the decision to make MMA his career. Ludwig, like Silva, recognized Carr’s talent and showed Carr what it takes to be a fighter and motivated him to take his career to the next level. Carr now trains with Team Alpha Male in Sacramento, California. 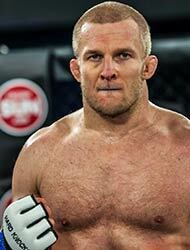 He was recruited by UFC fighter T.J. Dillashaw while training at Rafael Cordeiro’s gym, yet another professional fighter who has seen incredible potential in him. His ultimate goal, however, is not a world championship. Carr says he works hard, surrounds himself with people who keep him accountable, and he wants to give the gift of martial arts to others. On Friday, April 22 at Hard Knocks’ HK49, Carr will face Louis Sanoudakis, a 4-0 bantamweight from Montreal. Carr is certain he will get his shot in the UFC soon, but for now, he says he should be the number one pound for pound in Calgary and will beat Sanoudakis. Carr has dedicated his life to martial arts, and he knows his hard work will pay off.